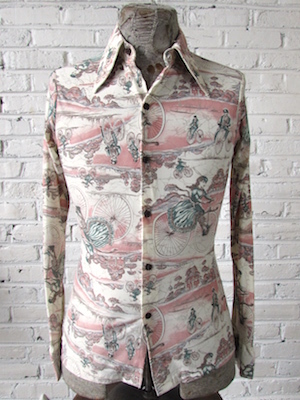 Home > Items just added 4/3-4/17 > (XS) Vintage Mens 70s Disco Shirt! Fancy Dames & Gents Riding Bicycles in the Park! Pink! Mens vintage 1970s disco shirt. 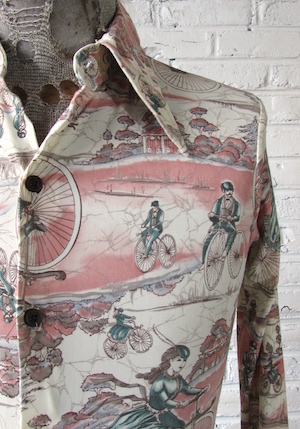 For the funky and sophisticated a fabulous disco shirt with a white base featuring fancy dames and gents riding bicycles through the park! The pattern on the shirt comes in a soft pink, brown, periwinkle and teal. Has a super wide & pointy disco era collar. Closes in the front with brown buttons with two matching buttons on each cuff. Shirt has a straight hem. Tagged by The Alfie. Acetate / Nylon blend.